Foot care becomes more important during monsoons. And especially if you are prone to wearing open footwear, then its inevitable that you are thumping in puddles of water after it rains which can be a breeding place for bacteria. This can lead to toe and fungal infections. It is essential to do a regular pedicure at home apart from the occasional parlour pedicure. Even if you can’t do a full pedicure, atleast do a warm water foot soak once in a while. A foot soak can also be a great relaxing and enjoying time for you. My favorite me time is soaking my foot in a tub of warm water with bath salts and watching some Youtube makeup videos while the rain and thunder shatters outside . 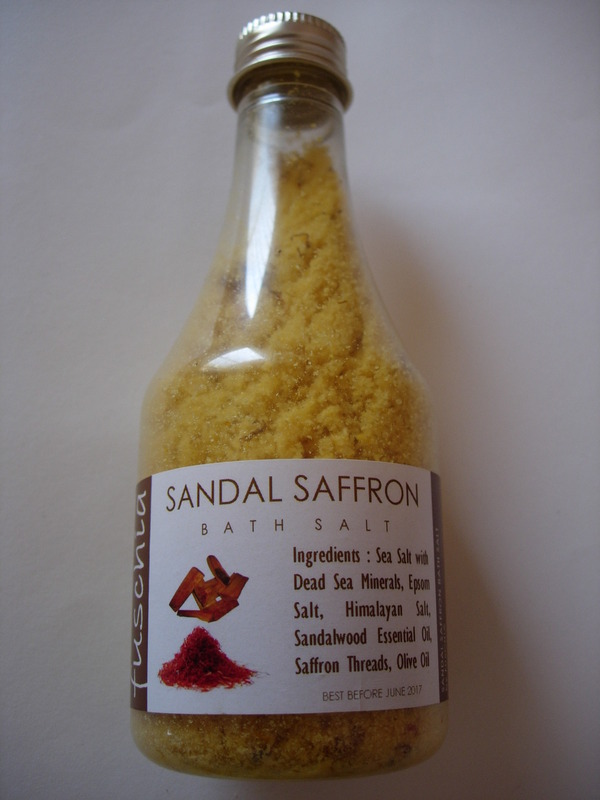 So as part of the Monsoon series, am reviewing Fuschia Sandal Saffron Bath Salt. While citrus bath salts are great for summers, I feel I need a warmer fragrance like sandal in monsoons and winters. What do you guys think? Fuschia Natural Handmade Bath Salts have been developed to mimic the properties of natural mineral baths or hot springs. The best way to refresh you after a long tiring day is to soak yourself in them. So simply allow the salts to swirl around gently as you take a deep breath, lie back and unwind in your own personal bath. Simply adding the bath salt to your bath water has several benefits. * It helps relax sore muscles, eliminate body aches and pains in joints and muscles. Relieves Stress. * Rejuvenates Skin by removing Dead Skin Cells. Leaves skin revived, comfortable & healthy looking. * A detoxifying delicately scented bath salt. Provides Warm, intense, rich aroma. Turns an ordinary bath into a relaxing and fragrant retreat. * Contains mineral-rich sea salt to reduce fluid retention & promote circulation, Blended with Epsom salt that detoxifies by drawing impurities from skin. * Free of parabens, phthalates. Sandalwood oil creates a calming & harmonizing effect on your mind, reducing tension & confusion. Saffron additionally lightens & tones your skin. Price: Rs.225 for 50g and Rs.425 for 200g. If you have read my previous post on Fuschia day and night creams, I had mentioned about the cute colorful string pouches. This too came in such a pouch. But the product claims cards was missing. They could have listed it on the bottle itself. During this chilly weather, I also add 2-3 spoons of this bath salt in my bucket of warm water for a relaxing bathing experience and to relieve muscle aches. Try this once and your entire bathroom will smell heavenly for a long time. * Warm and heavenly fragrance. It is long-lasting. * Deeply relaxes and relieves muscle tension and pains. * Cleans well and removes dead cells. * Helps in removing tan. * Free of parabens and phthalates. * Product claims and directions to use can be mentioned in the packaging. 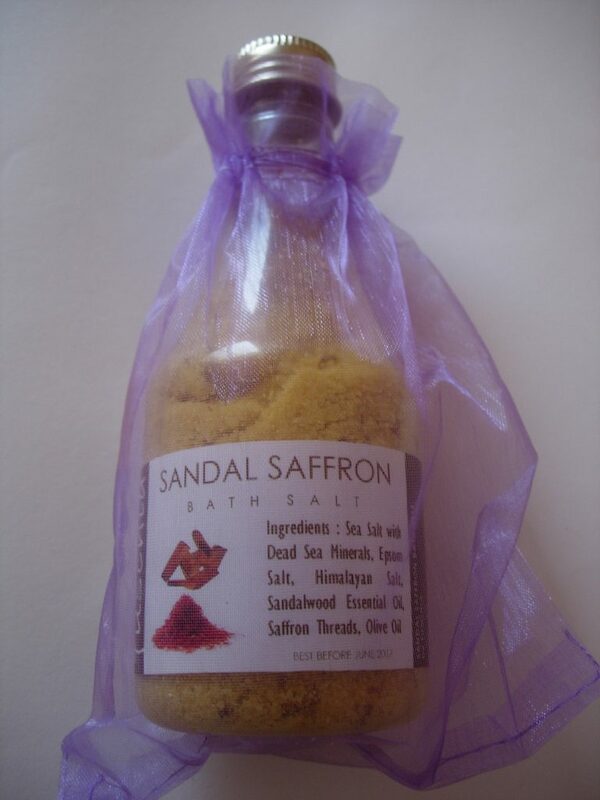 Fuschia Sandal Saffron Bath Salt gives a luxury spa effect at home. You can definitely try it for a deep relaxing and calming experience. Which bath salts have you tried? Which is your favorite? Share your experience in the comments below.